In a similar manner to the generation of the prostaglandins, AA can also be metabolized entirely within the cell by 5-, 12-, or 15-LOX to the potently bioactive LTs. Although 12-LOX was the first LOX to be identified in human platelets, it was the discovery of leukocyte 5-LOX that attracted most attention as it was recognized that this enzyme was responsible for the generation of both the slow-reacting substances of anaphylaxis (LTC4 or LTC4, LTD4, and LTE4; potent mediators of allergic responses) and LTB4, a powerful PMN chemoattractant . The first step in all the LOX pathways is the formation of the hydroperoxide of the parent straight-chain C-20 polyunsaturated fatty acid. Hydroperoxides derived from AA are termed hydroperoxye-icosatetraenoic acids (HPETEs) and are converted to hydroxyeicosatetraenoic acids (HETEs). Leukotrienes are conjugated trienes produced by the action of 5-LOX. Leukotrienes of the 4-series (LTA4, LTB4) are derived from AA, whereas the 3-series is derived from eicosatrienoic acid and the 5-series from eicosapentaenoic acid. LTA4 is an unstable 5,6-epoxy intermediate in the formation of LTB4. LTC4 is also formed from LTA4 by the action of g-glutamyl-S-transferase. LTD4 is formed from LTC4 by the action of g-glutamyl transpeptidase that removes glutamic acid, and further removal of glycine by cysteinyl glycinase gives rise to LTE4. LTF4 can arise from LTE4 by reincorporation of glutamic acid. Besides COX and the LOX pathways of AA metabolism, the cytochrome P450 superfamily of drug-metabolizing enzymes also generates epoxyeicosatrienoic acid (EETs) from AA. More recently, b-naphthoflavone-stimulated cytochrome P-450 in porcine coronary artery endothelial cells not only synthesized EETs, but was also shown to generate endothelium-derived hyperpolarizing factor, a critical factor in mediating vascular dilation. This discovery was particularly important, as substantial endothelium-dependent dilation to various stimuli was known to occur even after inhibition of both nitric oxide synthase and COX. Another family of eicosanoids derived from the concerted action of LOX-LOX or COX-LOX interaction are the LXs, which will be discussed in greater detail later. Figure 2 Eicosanoids and the microcirculation. Schematic representation of a given microcirculation showing the arterial section followed by the bed of capillaries prior to end into the venular side. 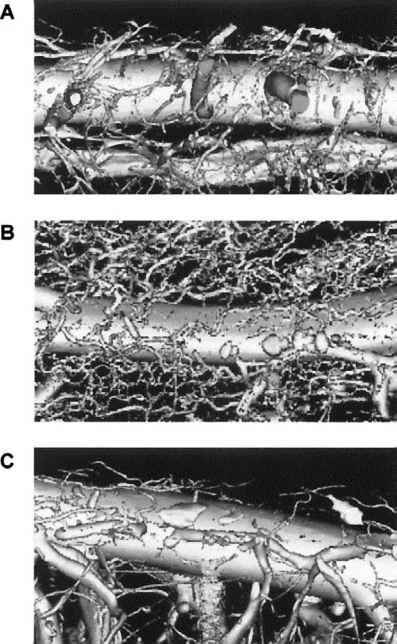 Eicosanoids have been reported to produce several effects on distinct sections of the vascular tree with a great degree of species and tissue specificity (see main text for more details). In general terms, prostaglandin E2 (PGE2) is the major vasoactive eicosanoid able to increase blood flow, thereby facilitating the process of plasma protein extravasation, as based upon the two-mediator theory. Direct effect on the capillaries is produced by peptidoleukotrienes, including LTC4 and LTD4, that act on the endothelial cells to directly promote changes in vascular permeability. The effect of LTB4 is less clear in the sense that, in line with several other chemoattractants, it can cause increases in vascular permeability indirectly, by promoting white blood cell adhesion. This latter point is particularly true at the level of the postcapillary venule, whereby LTB4 is the most potent eicosanoid in producing leukocyte recruitment. Lipoxin A4 (LXA4) and some prostaglandins (including prostacyclin or PGI2) are potent inhibitors of leukocyte recruitment, thereby producing tonic inhibition (as in the case of the antiadhesive actions of prostacyclin), or are predominantly involved during the resolution phase of inflammation (as is the case for LXA4). For the most part, products of the LOX pathway of AA metabolism contribute little to the changes in vascular tone. 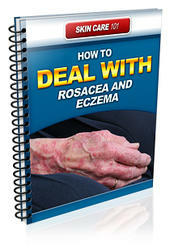 Moreover, the vascular effects that have been reported differ depending on the particular metabolite [8-10]. For instance, hydroperoxides of AA cause erythema in human skin and LTC4 and LTD4 are vasoconstrictors in guinea pig and rat, whereas LTB4 has no effect on blood flow in the rabbit or hamster cheek pouch model. However, it is possible that LTs influence vascular permeability, though this may be species dependent. LTC4 and LTD4 increase vascular permeability in human, guinea pig, and rat skin and are about 1,000 times more potent than histamine in inducing macromolecular leakage from postcapillary venules. In contrast, they have little or no activity in rabbit skin and unlike PGE2 do not potentiate bradykinin-mediated edema formation. LTB4, on the other hand, is a weak inducer of plasma exudation in rabbit skin but synergizes with vasodilator prostaglandins to cause enhanced plasma exudation. Despite its disparate and perhaps modest effects on the vasculature, LTB4 is one of the most potent endogenous chemotactic factors known. Once added to white blood cells, LTB4 induces chemotaxis, cell aggregation, and release of lysosomal enzymes. In vivo, LTB4 induces leukocyte accumulation in rabbit and human skin as well as in the anterior chamber of the rabbit eye. LTB4 superfusion over the hamster cheek pouch microvascular bed leads to leukocyte adhesion and emigration (diapedesis), whereas LTC4 and LTD4 are inactive. The potent effects of LTB4 on the recruitment of circulating leukocytes to the site of inflammation contributes to the increase of vascular permeability it produces, as mentioned in the previous subsection. There are conflicting opinions regarding the contribution of LTs to inflammatory pain, and this may depend on the model system investigated. For instance, LTB4 and LTC4 antagonize bradykinin-induced hyperalgesia in the rabbit ear. Similarly, at high doses, LTB4, LTC4, and LTD4 antagonize intradental nerve excitability. However, using the rat paw withdrawal model, LTB4 induces hyperalgesia in a manner that is dependent on circulating polymorphonuclear cells and activation of the 15-LOX pathway. 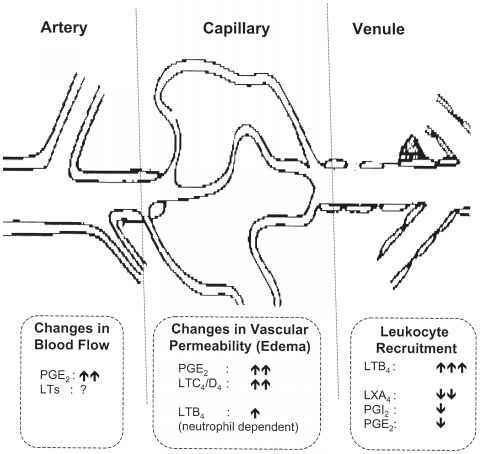 The three major pathways just described can operate independently or simultaneously within the vasculature. For instance, GM-CSF-primed neutrophils recruited to the inflammatory site can interact with platelets. After platelets adhere to the neutrophil surface, active leukocyte-generated LTA4 is released and transformed by platelet 12-LOX to generate LXs. Within the vasculature, the aspirin-triggered LX pathway can also be initiated when activated endothelial cells interact with adherent neutrophils to generate 15-epi-LXs. Leukocytes interacting with epithelial cell surfaces, as in the case of respiratory, renal, or gastrointestinal inflammation, can also generate LXs through bidirectional routes, in which (15S)-HETE and (15R)-HETE are released by epithelial cells and converted to LXs by neutrophils. The other component of this bidirectional interaction can involve neutrophil-released LTA4, which is converted by 15-LOX in epithelial cells, in particular tracheal epithelial cells, to generate LXs.